Water lilies add a touch of the exotic to your pond. Unlike other tropical blooms they are not difficult to grow. Like most flowers water lilies require eight hours of sunshine a day. Place the bulb in a container filled with potting soil that does not contain vermiculite or perlite. Cover the bulb with pebbles to weight it and the potting soil down. Place the container in the bottom of the pond at least 24 inches under water. Water lilies have broad round leaves from 4 to 8 inches across. The pads, or leaves, provide shade for fish and other water critters. They also provide a place for fish to hide from predators. The shade cuts down on sunlight in the depths and that decreases the amount of algae in a pond. Fish don't mind the algae but it does make the water murky green which some people consider unsightly. Water lilies add vibrant color to the pond. 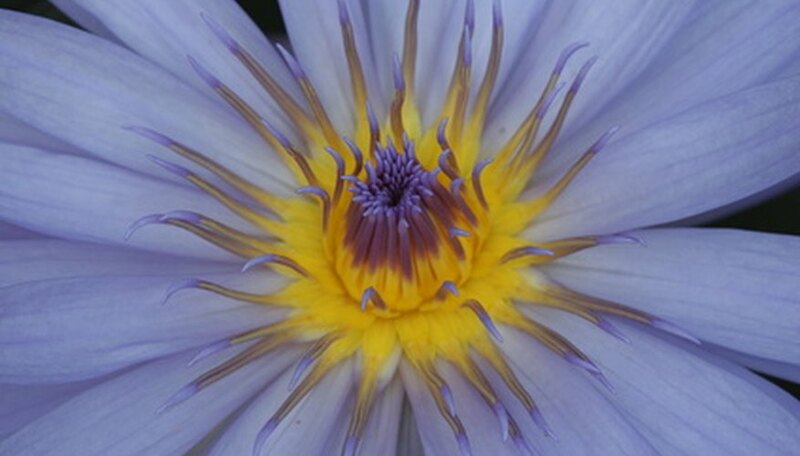 The flowers of the water lily are up to 4 inches across with oblong petals arranged in circles around the center. The centers are from light yellow to dark yellow. Tropical water lilies are not frost hardy. They will die if the pond water gets cold. The advantage of tropical water lilies is they will have many flowers on one plant. They also come in blue and purple which hardy water lilies don't. Hardy water lilies survive the winter as dormant tubers. When spring arrives the lily starts to grow and bloom again. Other colors for both hardy and tropical lilies include white, pink, yellow and a dark pink that is almost red. Tropical water lilies are highly scented. Hardy water lilies have little to no scent. Another advantage to tropical water lilies is that there are several varieties that bloom at night. Cut water lilies and place them in a vase of water up to their necks. Or cut the stems to 2 inches and float in a martini glass, bubble vase or shallow bowl. The stems may be supported by wrapping with floral wire. According to Dr. G.L. Thomas, Jr. the author of "Garden Pools, Water-Lilies and Goldfish" the flowers will follow their regular schedule of opening and closing. If you want to be sure the lilies will be open for a few hours against their schedule, put them in the fridge. They will open after being removed and stay open for awhile.